L'Assiette (French for "the plate" or "the dish") is quite possibly the most hyper-specialized restaurant to debut in LA in years. 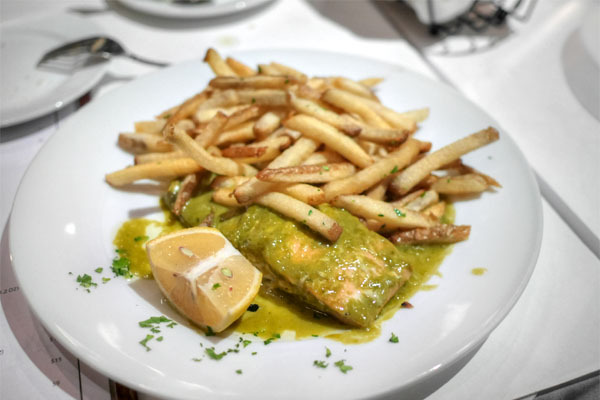 Modeled after the famed Le Relais de l'Entrecôte in Paris, the establishment bowed in March and focuses on the French (or Belgian, depending on whom you ask) national dish of steak frites, priding itself on preparing the staple as well as humanly possible. The place is the work of Jacques Fiorentino, a Paris native who moved to Florida at a young age and found himself in the hospitality trade. He worked as maître d' and later Manager for La Grenouille restaurant on Clearwater Beach, then moved to the Sand Key Club as GM. 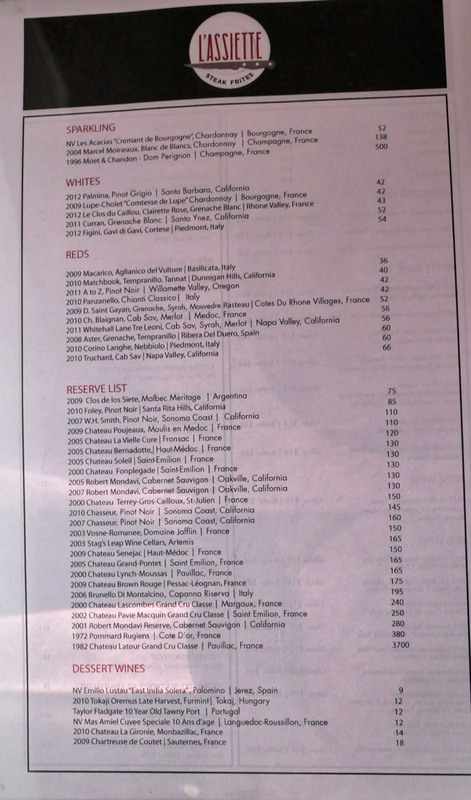 In 1975, Fiorentino relocated to Los Angeles and took on a position at Spectrum Foods, the company that gave Celestino Drago and Matteo Ferdinandi their starts in the City. He eventually transitioned to the entertainment industry a few years later, becoming a writer-slash-producer. However, Fiorentino always wanted to get back in the restaurant game, even conceptualizing a "Bistro Mignon de Paris" a few years back, but L'Assiette marks his true return to the biz, and to that effect, he's partnered up with former tenant Mary Anne Reyes (from Colonial Wine bar) as well as his son Marc Fiorentino (Director, Development & Production at Hyde Park Entertainment). 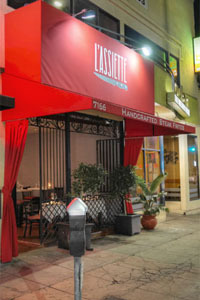 L'Assiette occupies the former home of Colonial, and before that, the likes of Tirovino Wine Bar, All' Angelo, Indira Cuisine of India, and Mumtaz Indian Cuisine. The space holds 50 and has been redone in wood, white, and burgundy to a convey a modern brasserie-esque aesthetic. 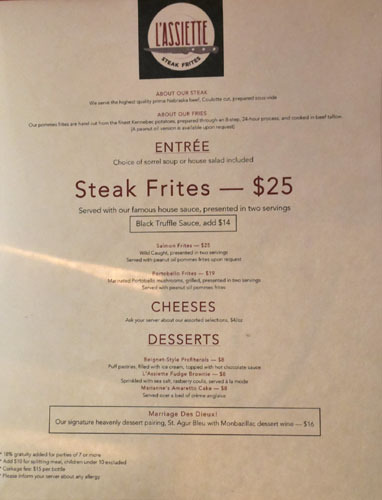 L'Assiette's menu is brief, with the main unit of consumption being the aforementioned steak frites, served in two portions and joined by a choice of soup or salad, all for a reasonable $25. You also have the option of adding on cheese, as well as a handful of desserts. 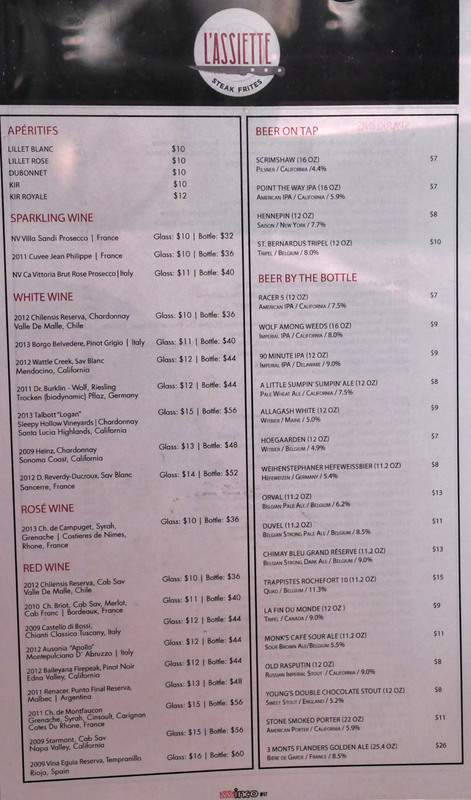 To drink, you get a nice selection of wines and, somewhat surprisingly, craft beers; corkage is $15. Click for larger versions. Bread was pretty basic, though somehow strangely addictive, especially when taken in concert with the paired olive oil-pesto combo. I brought along a couple beers to go with the food, the first of which was the 2012 Brouwerij Hof Ten Dormaal Barrel-Aged Project Brew No. 6 - Porto, basically a Belgian blonde aged for several months in oak Port barrels. The beer was indeed very "porty" on the nose, with a raisin-esque tinge that was quite apparent. In terms of taste, you had the initial Belgian-y characteristics up front, intermingled with vanilla-laced wood notes, with the finish redolent of dark fruit. We of course sampled both starters. 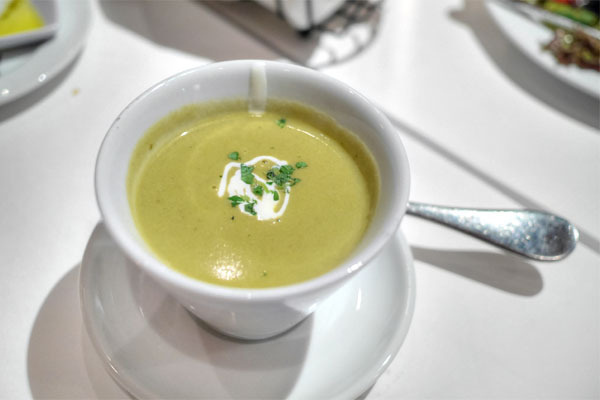 The Sorrel Soup was the stronger of the two for me, a hot, hearty, satisfying potage with an overarching brightness from the herb. 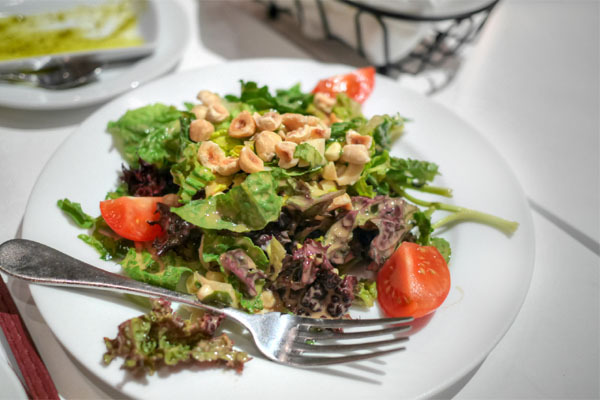 The House Salad wasn't bad though, with its tart dressing and pleasant crunch from the hazelnuts. And now we come to the pièce de résistance, a culotte (top sirloin) cut of Nebraska beef, cooked sous vide, sliced, and served with a special sauce. 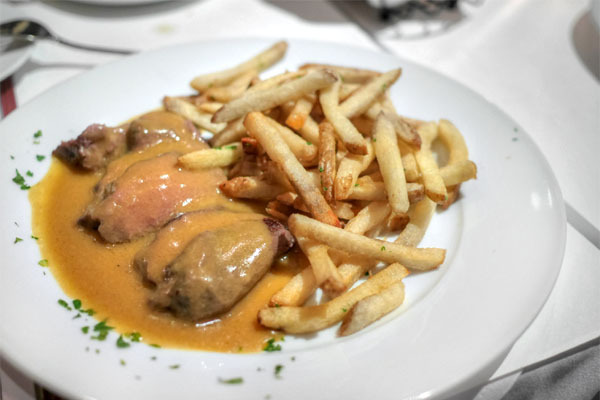 Note that L'Assiette eschews the traditional rump steak used in the dish, as well as the common preference for entrecôte (rib eye). No matter, the beef was indeed very tasty, and super tender, pairing swimmingly with the slight piquancy in the included condiment. I would've liked a stronger sear on the meat though, to give it more texture and char. As for the fries, they're hand-cut from Kennebec potatoes and cooked in beef tallow, and were delightfully crisp and pretty much perfect, so no complaints there. The seafood version of the dish, meanwhile, wasn't as successful, coming out on the dry, overcooked side, without any of that lushness you crave with salmon. 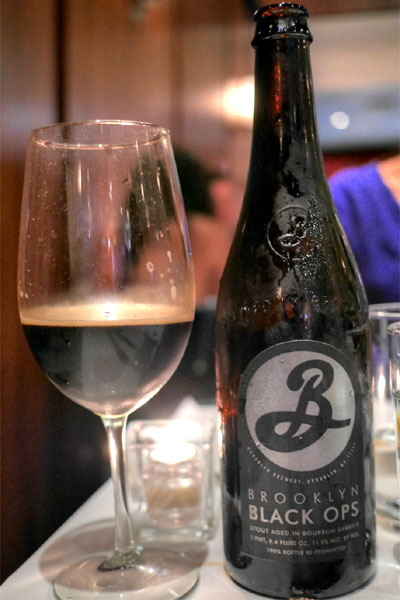 To go with the heftier plates and dessert, I cracked open a 2013 Brooklyn Brewery Black Ops, an imperial stout aged for four months in Woodford Reserve barrels and refermented with Champagne yeast. 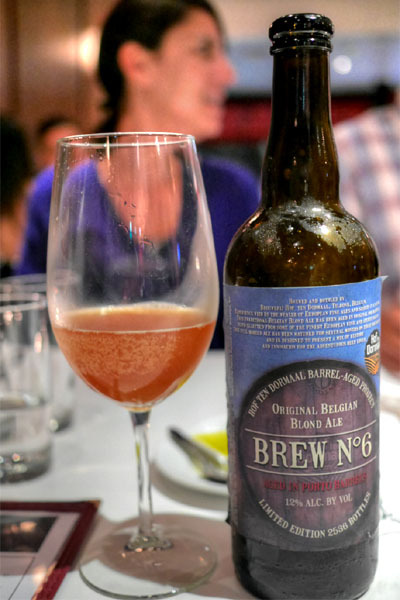 I found it really tasty, with your classic chocolate and coffee flavors intermixed with vanilla and bourbon notes, the whole thing coming through surprisingly light and effervescent. 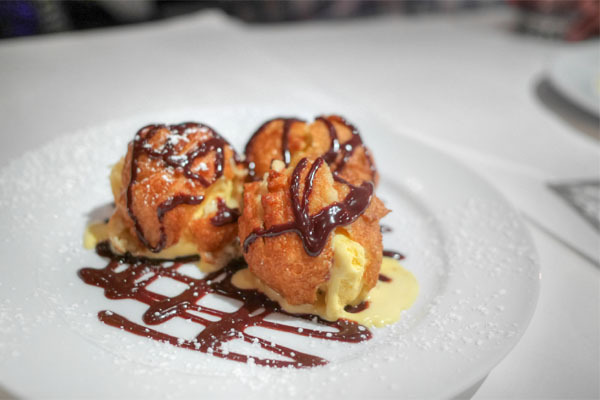 Profiteroles were about what you'd expect. Puff pastry, vanilla, chocolate--can't go too wrong with that. 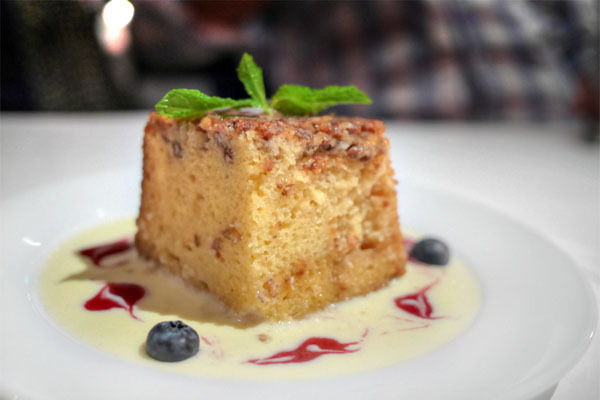 I was a fan of the amaretto cake, a dense, super moist rendition of the treat positively dripping with the sweet nutty goodness of the liqueur. Pretty damn delish. So L'Assiette's a curious concept. The steak is certainly enjoyable, with good flavor, but could've used a bit more sear, a bit more bite to take it to the next level. The fries were pretty much flawless though, but the fish option really needed to be tightened up. It'll be interesting to see how this one plays out. What an intresting concept. Do so called hyper specilized restaurants have a place in los angeles future? Anybody looking to check this place out, I'd suggest ordering one temperature below what you usually get. In other words, if you want medium, order medium rare. I do like this place a lot though, hope it starts getting more traffic. 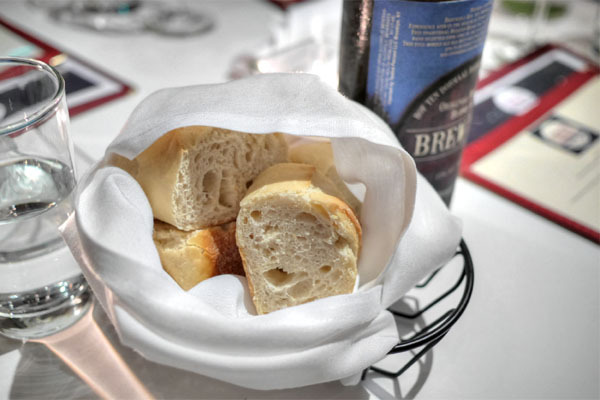 Hey Kevin, keep it up with the beer pairings! Really liking your picks. Anon: There are a few shops locally: Icon in Cypress, California Heights in Long Beach (same owner as Icon), Mr. K's in Placentia, Ramirez in East LA. I also purchase directly from breweries, have stuff shipped from out of state, and am getting into trading. Frank: Some solid advice. We ordered medium-rare for what it's worth, and the meat did probably veer toward the medium side. Anon: Oh believe me, I've got no intention of stopping any time soon. We thoroughly enjoyed our meal there and have recommended it to our friends. 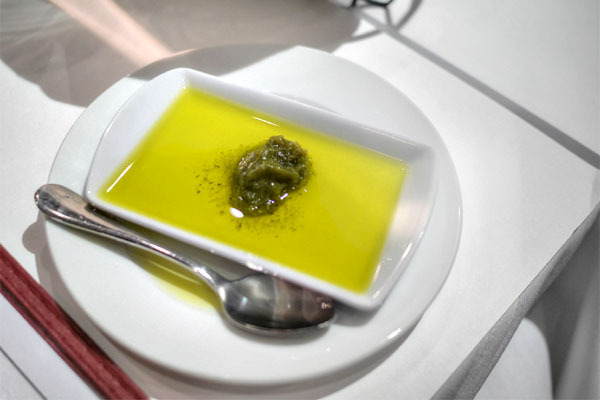 The concept of having your entree in 2 servings should not be overlooked. The meat and fries come out hot and fresh twice so the last bite is as good as the first. I hope they stick around. If you are looking forward to install Kodi For iPhone APK file then also we have provided working guide for the same. We always provide the official links only to download the app for Android or iPhone and even for PC also.